In two days, I will be at the Annual BlogHer Conference and I'm sort of freaking out. Technically BlogHer will be my third conference. Remember back in April I was invited to speak at Hispanicize and then in May I had the honor of being named one of the Top Blogueras and invited to The White House. Don't get me wrong, I was nervous then too. But Hispanicize, I had to travel to Miami. It was my first big trip away from The Boy and I was speaking on a panel. That occupied most of my worry. And DC was a small group of about 70 women - many I met at Hispanicize. But this is BlogHer! The mother of all blog conferences for women. Like thousands of women. Women from all over the world. Major bloggers, mega brands and powerhouse social media influencers and experts. I mean check out the Keynote speakers: Martha Stewart (Oooohhh) Katie Couric (What?! ), Soledad O'Brian (OMG!!! ), Malaak Compton-Rock (YAY!) and Christy Turlington Burns (Whoa...)! I am nervous but also giddy with bloggy girl excitement! There's Thursday - the Health Minder Day. I'll get to listen and learn from some pretty amazing ladies like, Ellen of Love That Max, Kristina Chew, Susan Senator and Laura Shumaker. I get to hang with my Amigas: Ruby and Rachel. And so many more fabulous blogueras. I'll get to meet (for the first time!) some of favorite Special Needs/Autism Mom bloggers. But I'll let Alysia tell you who since we're both excited about the same people. I'll also be in my hometown of NYC. Which means, no hassle and expense of traveling or packing since the hotel is only a subway ride away. Also being in NYC adds to my comfort level of what to wear. I'm a pretty jaded New Yorker and as a former party girl - I never really worry if I'm over dressed or under dressed so long as I feel good in what I'm wearing. I'm excited about the parties, meeting new people and networking. I'm excited because I am doing something for me. I am investing in myself. And that in itself is worthy of celebration. Come to think of it, maybe there's nothing to be freaking out about after all. Maybe three times really is the charm. I used to be a squeamish kind of gal. Before becoming a mom, I had never spit on my hand to wipe a face. I never used an article of (my own) clothing to wipe a nose or mouth. I never cupped puke in my hand (to keep it from spilling on the floor) or had poop on my arm. If you're not a mom and reading this - it's okay to be grossed out. If you are a mom and reading this, you'll probably laugh because you can relate. I don't think any of the parenting books I read prepared me for how messy babies/kids could be. Or how stressful dealing with messes can be. Because messes are often unpredictable. A mess can happen anywhere and at anytime. A mess could care less if you're in the middle of dinner or out shopping. So how do I tackle a parenting mess without stress? I don't stress. Or at least, I try really hard not to. Raising a six year old autistic boy (who still isn't night time potty trained), I have my fair share of messes. I try to get through messy situations with an act first and laugh later attitude. I tackle the mess as quickly and calmly as possible. Because if I stress the mess, The Boy will become stressed. And a stressed out kid, in the middle of a mess is the last thing I want. And just as important as how to tackle mess, is what you use to tackle it. So I'm excited to tell you about Huggies new and improved products designed to withstand the real life challenges of parenting: Huggies Snug Dry Diapers and Huggies Wipes. Huggies encourages parents to try the new and improved Huggies Diapers and Wipes by putting Huggies to the test on Facebook! Go to the Huggies Latino Facebook Page and share your stories about Huggies for a chance to win a fully-stocked Huggies diaper bag. And to help spread the word about this fun campaign, Huggies has collaborated with Poncho de Anda and Lina Amashta to put Huggies to the test during life’s stresses and messes. So you tell me - How DO YOU tackle parenting messes & stresses? *This is a sponsored post in collaboration with Latina Bloggers Connect and Huggies. All thoughts are my own. Suppose that I told you my toes had turned blue? Suppose that I started to fly overhead? Or spread candy and presents all over your bed? do you think, Emmy Brown, you would listen to me? If you are the parent of a child with autism or any other attention issues you will relate to little Emily Brown. Emily Brown is a little girl who has difficulty focusing and her mother is trying desperately to get her attention. It's beautifully illustrated pictures will be appeal to young children. The illustrations are also perfect to engage conversation. What color is Emily's shirt? If your child is non-verbal, ask them to point to colors, shapes or objects. And if your child is not able to point - use hand over hand to lead to help them. With its lighthearted and humorous language, Pay Attention Emily Brown! will be enjoyed by both parent and child. And the message of unconditional love and acceptance is reaffirming for special needs children. Last Friday morning I woke up and learned about the movie theatre massacre in Aurora. Twelve people were killed - including 6 year old, Veronica Moser-Sullivan. More than 50 people were injured. Among the injured, a pregnant woman. I've spent the last few days glued to the news, unable to stop watching the coverage. And the stories are horrific and heartbreaking. I wonder if he realizes how damaging his words are to the autism community? He should know the stigma so many children and parents face. Autism is word so many parents fear. And Scarborough's statement? It perpetuates that fear. His statement is reminiscent of the 1950s when autism was labeled as 'childhood schizophrenia' and the 'Refrigerator Mother' theory. The year is 2012 and with all of the information out there on autism, there are people who still have no idea what autism is or what it "looks" like. Ignorant people who will take Joe Scarborough's statement and run with it. That being said, there is a small part of me that understands where his statement comes from. And we can all have our speculations. However, I am not a doctor and neither is Joe Scarborough. So for Scarborough to make an "amateur diagnosis" based off of sound bites from people who knew James Holmes, is not only reckless but just as ignorant as 50 Cent's tweet. Now is not the time to play guess the diagnosis. This is the time to have a discussion that's long overdue. The Aurora massacre is the kind of senseless tragedy that gives a nation pause. It will dominate the the news for weeks. But will any real change come of this? While it was reported that the weapons were purchased legally, I have trouble understanding how a single individual - a civilian - is able to purchase more than 6,000 rounds of ammunition without raising an eyebrow? How can a civilian be allowed to purchase tear gas? Somehow, I don't believe this is what the forefathers meant by the right to bear arms. As one of my FB friends stated, "It's easier for a person to get a gun in this country, than mental health services." That's exactly the point I wish Joe Scarborough would have focused on. UPDATE: Since I posted, Joe Scarborough released a statement clarifying his remarks regarding Holmes being on the "autism scale." ...I suggested that the Aurora tragedy should make Americans focus more on mental health in this country. I also stated that my own experiences raising a son with Aspergers made me keenly aware of how important strong support systems are to those who might otherwise be isolated. Hmmmm not really the kind of statement I think the autism community was looking for. But just don't take my word for it, check out what this guy has to say. I've been up since 4 am. Not by choice. That's the time The Boy woke up. By 6 am, I was half dressed and packing up The Boy's bookbag for his first day at a new school. And by 7 am, The Boy's school bus pulled up in front of our building. I introduced myself to the new driver and matron. The Boy jumped on the school without looking back or a goodbye kiss. But The Husband and I called his name and we got the goodbye kisses we needed. Walking back up to our building, I started to cry. I know, I know - I'm a cry baby. Norrin has been taking the school bus since he was a baby - barely 3 years old. He's been taking the bus since before he could even talk and while he was still in diapers. This is the 3rd school he's been bussed to in the last four 4 years. You would think I'd be used to it by now. But it doesn't get easier. Handing your child over to a stranger for the first time. And this new school is the farthest The Boy's ever been. Don't get me wrong - I LOVE the new school. I'm so happy he's there. It's the right place for him to be. It was just never the place I expected him to be. When The Boy was diagnosed with autism 4 years ago and we started the therapies - I remember The Husband telling me, "This is just to get him up to speed. By the time kindergarten starts - he'll be able to go to a regular school." Because for many parents that's the goal. Mainstream education. It's the dream. I think there was this tiny part of me that wanted to believe that. That's the thing about life down the autism rabbit hole. You can make peace with it, embrace it but accept it? Acceptance is not a one shot deal, it's an on going process. There will always be something new to accept. The Boy's kindergarten year came and went. And the fact is, he couldn't cope in a typical public school. Even in a classroom of 6 kids. Even with all the accommodations. Even with the after school ABA therapists coming to the house 4 days a week. Even with sensory gym on Saturdays. The Boy still couldn't truly be successful in a 'regular' public school. Granted The Boy was set up for failure but this last year was a huge eye opener for me. So this morning as I waited next to a mother with her 13 year old son - who was also waiting for his yellow mini bus to appear - I realized that The Boy may never go to a school within walking distance. The Boy may be 13, 14, 15 years old and will still need me to wait with him for the mini bus to pick him up. The Boys new school goes to 21 - he will probably be there until that age. The Boy will probably never have a mainstream education. I have to just let that dream go. I'm okay with it. At the end of the day, all I want is for The Boy to be in a place where he can be happy and accepted for what he can do. I know The Boy's education is about goals not grades. And I also know there are plenty of new dreams to be had. I have loved Madonna since I was a in the 4th grade. I remember the day when I walked to Sam Goody to buy the Like a Virgin tape. That's right kids, I said tape. I played the title song over and over again having no clue what the words meant but belted it out at the top of my lungs. And since that day in I have seen Madonna evolve over and over again. She is hailed as the Queen of Reinvention. Because she's always reinvented herself at just the right times of her life. I've admired her for it. She is fearless and thinks nothing of reinventing her image when it suits her. And with every change, she's become more successful, more refined, more powerful and more fabulous. 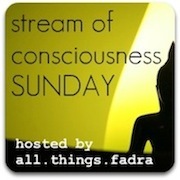 Today is Fadra's last Sunday hosting the Stream of Conciousness Meme post and it's about reinvention. I don't participate often but since it's her last one and I've always enjoyed writing them - I decided to link up one last time. And the theme of reinvention works with what I am going through right now. I am trying to reinvent myself. Well, my outer self. I am sitting on the sofa as I type this; my entire body is sore from exercising. Today was the third day in a row that I've made the conscious decision to work out. To get in shape. To live healthier. To hopefully, live longer. I have been struggling with my weight for the last two years. And last June I wrote a post about The Weight of Autism. Thinking that I was going to make the effort. But since that post, I've gained more weight. I know what it is - I've spent the last few years craving comfort from all the wrong places. And while the comfort I crave feels so good in the moment. I know, it's time for me to seek comfort elsewhere. Because every time I step on the scale, I cringe. Every time I have to squeeze into a pair of jeans that used to fit, I curse myself. Every time I have to look for a shirt that conceals my muffin top, I hate it. Every time I put something on only to realize it no longer fits, I wonder - how could I let this happen? In less than 3 months I will be one more year closer to 40. And in the last few months I've had some serious wake up calls regarding health and the choices I've been making. 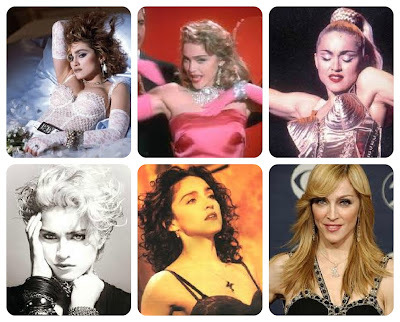 When I was in the 4th grade, I wanted to wear white lace gloves and black rubber bracelets because Madonna wore them. Decades later, I'm still taking lessons from the Madonna handbook.